A book that challenges most of the cherished assumptions of drug medicine. It lays bare many of the deceptions in medical statistics – most of them intended, it seems. It shows how results of valid medical research are deliberately distorted to promote long-term use of drugs of dubious value. It exposes the deep prejudice of practitioners of drug medicine against natural, non-toxic drug therapies. This book clearly delineates the scientific basis of energetic-molecular events that cause disease, and shows how accelerated oxidative injury to human enzyme systems – comprised of energy, detoxification and digestive enzymes – is the cause of all disease processes. Furthermore, it describes how oxidative enzyme injury leads to disruptions of the bowel, blood and other body organ ecosystems. 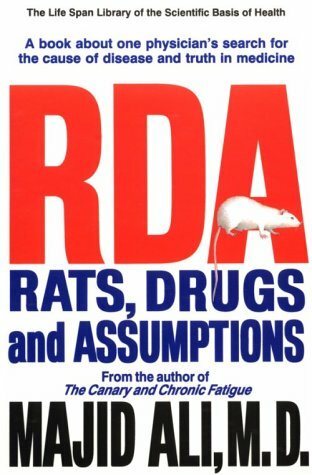 In Rats, Drugs, and Assumption, Dr. Ali addresses larger philosophic and ethical matters of enormous significance for the society and the medical profession. Below is the preface of this book in which shows why this ook needed to be written. The notion of Recommended Daily Allowances (RDA) is the most pernicious idea of 20th-century medicine. In 1940 the Food and Nutrition Board established amounts of several nutrients that it considered sufficient to prevent some nutritional deficiency diseases. This was unequivocally the worst medical folly ever foisted on the American people by government experts. None of the “experts” who sat on the Nutrition Board proclaiming the RDA doctrine had ever practiced nutritional medicine, nor did they ever evaluate clinical results of nutritionists. Notwithstanding, the RDA doctrine led to a widespread assumption among physicians that nutrients play no role in reversing chronic disorders. It also led to the second and more dangerous assumption that diseases could only be treated with drugs. Little did anyone recognize that these two seemingly innocent assumptions would rob millions of Americans of untold opportunities in using nontoxic, nondrug nutrient therapies for disease prevention and treatment of chronic disorders. The tragic error of the RDA is that it went on to spawn generations of physicians who turned their backs on the essential healing properties of nutrients, and became staunch opponents of all nondrug therapies. Ignorant in the true nature of the healing response and ill-informed about the role of nutrients in it, they declared all nutrient therapies quackery and relentlessly persecuted physician-nutritionists. Drugs and scalpels became the only acceptable tools of the trade. Laws were enacted to revoke the licenses of practitioners who practiced unconventional (meaning nondrug and nonsurgical) therapies. When life begins, it begins to end. The healing response occurs as a natural response to the aging phenomenon—beginning at the onset of life and lasting till life ends. Both the aging and healing phenomena are energy events. Injured tissues heal spontaneously. Damaged molecules, cells and tissues are programmed to generate their own healing cues. External factors may facilitate or impede the healing response, but they cannot set the wheels of healing in motion. Good medicine must be centered on this. simple but revealing question. Physicians are among the most highly educated, hard working and diligent individuals in any society. They see human suffering in ways no other profession does. Their whole lives are dedicated to alleviating suffering. Yet, when it comes to reversing chronic disorders, they have become impervious to the most elementary of ideas: that injured tissues heal with nutrients, and nutrients must be considered the most logical and natural therapy. I have often wondered why my colleagues in drug medicine cannot see this. Why has the use of nutrients in clinical medicine been neglected to date? American taxpayers have paid dearly for a huge body of research in nutrition. With rare exceptions, such studies clearly demonstrate the health benefits of nutrients— drawing conclusions that, in general, are entirely predictable on teleologic grounds alone. (After all, the healing response evolved with nutrients over eons.) Why have the results of all such research been excluded from clinical medicine? Why have the healing potentials of vitamins, minerals and essential amino and fatty acids been so maligned in the U.S.? Why have nutritionist-physicians been so harassed by the disease doctors of drug medicine? The answers to all these questions have to do with the establishment of RDAs—the minute amounts of vitamins and minerals that the Nutrition Board assumes are necessary to prevent a few deficiency diseases such as scurvy (by vitamin C), beri (by thiamine), pellagra (by niacin), rickets (by vitamin D) and others. The irreversibility of chronic disease is the underlying premise of drug medicine in the U.S. This assumption leads to the erroneous belief that chronic disease can only be managed by suppressing its symptoms with drugs. This assumption is not formally taught in medical school. Rather, it grows quickly in the minds of young physicians as they recognize that drugs and scalpels are the only tools of their trade—and that only quacks talk about the regenerative capacity of the body and nondrug therapies to facilitate that process. Drugs block cell membrane channels that normally regulate the flow of essential minerals such as calcium, potassium and magnesium, i.e., calcium channel blocker drugs such as Calan and Cardizem. A partial list of the toxic effects of such drugs, given in the Physicians’ Desk Reference (PDR), includes heart block, palpitations, sexual difficulties, loss of consciousness, congestive heart failure, depression, loss of memory, insomnia, tinnitus, tremors, liver injury, loss of hair and abdominal symptoms. Magnesium is nature’s calcium channel blocker. It works slowly but never creates the adverse reactions caused by calcium channel blocking drugs. Looseness of the bowel movements is the only change with oral magnesium therapy that may be seen in a negative light—not a bad effect from a life span perspective. Drugs block cell membrane receptors, i.e., Beta blocker drugs used for high blood pressure, such as Inderal and Lopressor. A partial list of the toxic effects of such drugs given in the PDR include congestive heart failure, a type of heart block called AV block, low blood pressure, Raynaud’s type vascular insufficiency (cold hands and feet), depression, fatigue, lightheadedness, memory loss, constipation and/or diarrhea, colitis, loss of hair, lupus-like condition, impotence and bone marrow suppression. Taurine is nature’s membrane receptor stabilizer. It is a potent antioxidant, and occurs in large amounts in almost all cells. Its clinical benefits in preventing and controlling heart rhythm disturbances have been observed by all reporting clinicians. It, of course, has none of the adverse effects of beta blocker drugs. Drugs block or inactivate mediators of inflammation—the essential response in injured tissues that precedes the repair and healing phenomena. Examples: histamine-inactivating drugs such as Benadryl and Seldane. Adverse effects of such drugs include drowsiness, fatigue and concentration difficulties. Bioflavonoids, pantothenic acid and histidine are nature’s antihistaminics. Underlying the notion of RDAs are four dangerous assumptions that have had a profoundly detrimental impact on medical thinking over the last several decades. nutrients do not play any metabolic roles in the healing process, except those identified in the prevention of a handful of nutritional deficiency diseases. chronic degenerative, ecologic and immune disorders, such disorders can only be treated with drugs. because drugs can only suppress symptoms of chronic degenerative, ecologic, immune, nutritional, stress-related or physical disorders, such disorders must be accepted as irreversible. because drugs cannot normalize deranged cell membranes and revive damaged bowel, blood and cellular ecosystems, a sound, working knowledge of human ecosystems is of no relevance to clinical medicine. Since humankind began to search for ways to alleviate suffering caused by illness, medicine has been empirical—it sought to use therapies that worked and were safe. In empirical medicine, safe and effective therapies are not discarded just because it is not known how they work. This is the core principle of the philosophy of the great ancient healing arts of India, China and Greece. The empirical medicine must now evolve into an “energetic-molecular (EM)” medicine—a medicine that holds the enduring principle of empiricism of the ancient healing arts and adds to it the science and technology of energetic-molecular (EM) dynamics of health—dis-ease—disease continuum. The medicine of future—I am certain—will be this EM medicine. I devote the chapter entitled A Changing Medicine for a Changing Time to my vision of what such a medicine will be—and how it will continue to evolve. This is a medicine based on EM events that occur in molecules (and cells and tissues) before they are injured and changed. It is not based on the study of how dead and decaying cells and tissues look under the microscope after they have been damaged by disease. Physicians who practice drug medicine assume that the chemistry of disease is all they need to know. Sadly, most physicians practicing drug medicine do not know even the chemistry of drug medicine in any detail—otherwise they would quickly learn the reasons why drugs cannot reverse chronic disease, and why every attempt should be made to substitute nutrients for drugs in chronic disease as soon as possible. 1. EM injury to cells, tissues and body organs is reversible. 2. EM healing response in injured cells, tissues and body organs occurs spontaneously and requires an ample supply of essential nutrients. In acute illness, drugs are necessary to break the hold of EM derangements that feed upon each other and perpetuate disease. This is irrelevant to the care of patients with chronic nutritional, ecologic, degenerative, stress-related and physical disorders. I graduated from medical school in 1963. In 1968, I passed the examination and received the diploma of the Fellow of the Royal College of Surgeons of England. Four years later, after completing my pathology residence, I was certified by the American Boards of Clinical and Anatomic Pathology. In 1974, I was appointed Director of the Department of Pathology, Immunology and Laboratories at Holy Name Hospital, Teaneck, New Jersey. From 1974 to 1986, I practiced some clinical medicine but largely devoted my time to research and the practice of pathology. During those years, I estimate that I examined over 50,000 biopsies and surgical specimens. During those years, I also authored and coauthored a series of twelve books written for pathologists preparing to take their board examination. Needless to say, I became well-versed with the names of diseases and the criteria for their diagnosis. My early years of microscopic diagnostic work with biopsy and surgical specimens gave me a growing dissatisfaction with my inability to learn about the initial EM events that cause disease. I diagnosed thousands of diseases, and learned about others that I didn’t see in pathology textbooks. 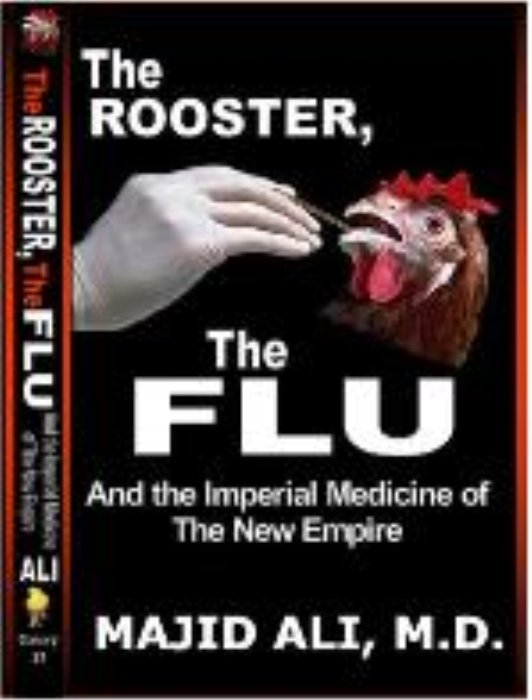 The EM events that initiated all such diseases remained elusive. I became acutely aware of the microscope’s limitation and turned my focus to the immune system. My clinical work and research in this area—in collaboration with my colleague Madhava Ramanarayanan, Ph.D., and others—led to our introduction of micro-elisa tests for the diagnosis of food incompatibilities and food allergy. never to doubt the veracity of any statements made by any of my patients. Yes, it would carry the clear risk that someone vehemently opposed to empirical medicine might try to make a fool of me by feeding me deliberate lies. If so, so be it. to limit my inquiries to two basic elements: 1) The words a patient uses to describe his suffering; and 2) The EM events that provide the basis of that suffering. Specifically, I decided to ignore the disease names that tell me nothing—but hide much—about the cause of a patient’s suffering. and most importantly, to disregard my medical textbooks whenever a patient’s clinical picture does not fit an established disease name. This seemed a reasonable personal philosophy as I began to confront the illnesses that I knew could only be caused by the impact of internal and external environments on human genetic make-up. Healing is a person’s natural state. It is not natural to be sick. In essence, life is energy, and health is an energy state. Diseases occur when the natural energetic state of tissues is burdened by elements in a person’s internal and external environments. In health, the internal environment is preserved by the interplay of genes, metabolism of food and stress-related factors; the external environment is made up of some natural hazards and an increasing number of man-made toxic pollutants. Life is created with energy. Life is sustained with energy. Life ends when energy is depleted. When molecules, cells, tissues and organs are injured, they heal with energy, and such healing is a spontaneous process. Diseases occur when there are impediments in the way of tissue healing. An internist’s drugs never heal. A surgeon’s scalpel never heals. Organs, tissues and molecules have an innate ability to heal. What drugs and scalpels do well in acute diseases is to remove impediments to healing. Self-regulation with energy— “autoregulation” as I define in The Cortical Monkey and Healing—works exactly the same way in chronic ecologic, immune and nutritional disorders. I maintain that this is the true nature of healing. Mind-over-body healing does not work, notwithstanding rather limited, temporary benefits of positive thinking and affirmations. An energy-over-mind approach to healing does. Psychosomatic and somatopsychic models of diseases are artifacts of our thinking. Diseases are burdens on biology. These burdens are imposed on our genetic make-up by our internal and external environments. The intensity of suffering caused by these burdens is profoundly influenced by a third element: the choices we make. Canary, I write about political pundits who incubate grand schemes in their clever minds to solve America’s health problems with brilliant legislative strokes. The problem with such pundits is that they cannot distinguish between front-end medicine and tail-end medicine. Front-end medicine is the prevention of disease by addressing the initial EM events that separate a state of health from a state of absence of health. Tail-end medicine, by contrast, only suppresses symptoms of advanced chronic disease with drugs. Physicians, in general, are skeptical about the prevailing concepts of preventive medicine. They recognize that they can only pay lip service to preventive measures such as balanced diet, choice of low-cholesterol foods, relaxation, loss of excess weight and physical fitness. Their offices and clinics are not set up to effectively pursue any of these measures. (Drug doctors only know how to use drugs. How does one use drugs to prevent disease?) Even when they hear experts gloat about success in the early diagnosis of cancers of the breast and cervix, they recognize early diagnosis is not prevention. Genuine disease prevention calls for focus on nutrition; food incompatibilities and allergy; integrity of bowel, blood and other body ecosystems; Fourth-of-July chemistry under the skin—oxidative storms caused by stress—and physical fitness. Mainstream physicians are neither trained nor equipped to cope with any of these problems. with the bowel ecosystem and how cellular ecosystems interface with the blood ecosystem. It will seek to preserve the integrity of such ecosystems and enhance such relationships rather than disrupt them with chemicals. Drugs, while essential for symptom suppression in acute illness, cannot revive damaged ecosystems. with human ecosystems. Such substances will include minerals, vitamins, essential amino acids and fatty acids, and natural plant and animal materials contained in herbs. It will not seek to launch a chemical attack on physiological processes using synthetic drugs. It will also harness physical and energetic healing methods of proven efficacy. Drugs will continue to save lives in acute, life-threatening illness. However, I’m afraid that drugs will also continue to treat chronic illness for limited short-term gains and serious long-term adverse consequences—simply because there will always be stakeholders in drug medicine who will forever find ingenious ways to persuade physicians to promote their drugs. clinical outcome studies by those who understand the principles and practice of evolving EM medicine. I hope the information I present, and the arguments I marshall to make the case for the nondrug therapies of the EM medicine, will quell some of the ignorant animus of practitioners of drug medicine against natural, nondrug therapies. I hope this information will raise some questions about the assumption of irreversibility of chronic disease that chains physicians to the prevailing model of drug medicine. I hope that sound scientific knowledge of the eco-relationships I describe will help the professional as well as the general reader attain a genuine understanding of the rationale for nondrug therapies. 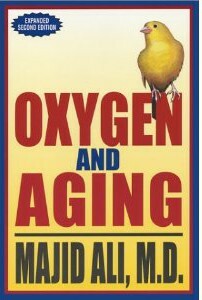 I also hope these materials will help my readers make informed, enlightened choices in matters of health and disease.